Saturday's second one-day international between Afghanistan and Ireland in India was abandoned because of rain. Opener Hazratullah Zazai was top scorer with 67 and Rahmat Shah added 54 as Afghanistan reached 250-7 after 48.3 overs when play was halted in Dehradun. 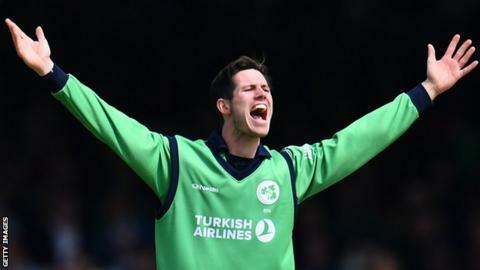 Ireland's spinners did the damage with George Dockrell taking 3-51 while Andy McBrine had figures of 2-43. Afghanistan won Thursday's opener and the teams meet again on Tuesday in the third of five ODIs. Zazai's quick-fire knock, with his 67 coming off 43 balls, helped the Afghans to an opening stand of 90. Hashmatullah Shahidi (52) was a third Afghanistan batsman to chalk up a half-century as they made steady progress. There was also a wicket apiece for Simi Singh (1-33) and paceman Boyd Rankin (1-38). Afghanistan beat Ireland 3-0 in a T20 series and there will be a Test match between the sides after the ODIs.